If you’ve never had endodontic treatment—also known as “a root canal”—or if it’s been many years since your last procedure, you may have questions or outdated expectations. More than 14 million teeth receive endodontic treatment each year. By choosing endodontic treatment, you are choosing to keep your natural teeth as a healthy foundation for chewing and biting for years to come. These web pages will answer your questions and explains how today’s endodontic treatment saves teeth. If you would like to know more, be sure to contact our staff at Westside Endodontics, (503) 693-6163. All dentists, including your general dentist, received training in endodontic treatment in dental school. General dentists can perform endodontic procedures along with other dental procedures, but most often they refer patients needing endodontic treatment to endodontists. Endodontists are dentists with special training in endodontic procedures. They only do endodontics in their practices because they are specialists. To become specialists, they complete dental school and an additional two or more years of advanced training in endodontics. They perform routine as well as difficult and very complex endodontic procedures, including endodontic surgery. Endodontists are also experienced at finding the cause of oral and facial pain that has been difficult to diagnose. At Westside Endodontics, all of our procedures are performed under the use of a Surgical Operating Microscope to obtain the highest level of treatment. “Endo” is the Greek “word for “inside” and “odont” is Greek for “tooth.” Endodontic treatment treats the inside of the tooth. 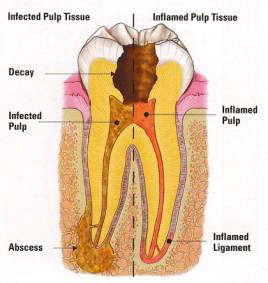 The pulp extends from the crown of the tooth to the tip of the roots where it connects to the tissue, surrounding the root. The pulp is important during a tooth’s growth and development. However, once a tooth is fully mature it can survive without the pulp, because the tooth continues to be nourished by the tissues surrounding it. Endodontic treatment is necessary when the pulp becomes inflamed or infected. The inflammation or infection can have a variety of causes: deep decay, repeated dental procedures on the tooth, or a crack or chip in the tooth. In addition, trauma to a tooth may cause pulp damage even if the tooth has no visible chips or cracks. If pulp inflammation or infection is left untreated, it can cause pain or lead to an abscess. The endodontist removes the inflamed or infected pulp, carefully cleans and shapes the inside of the tooth, then fills and seals the space. Afterwards, you “will return to your dentist, -who will place a crown or other restoration on the tooth to protect and restore it to full function. After restoration, the tooth continues to function like any other tooth. For the first few days after treatment, your tooth may feel sensitive, especially if there -was pain or infection before the procedure. This discomfort can be relieved with over-the-counter or prescription medications. Follow your endodontist’s instructions carefully. The cost varies depending on how severe the problem is and ‘which tooth is affected. Molars are more difficult to treat and usually cost more. Most dental insurance policies provide coverage for endodontic treatment. You should check with your insurance carrier for endodontic coverage. New trauma, deep decay, a loose, a cracked, or broken filling or lack of a permanent restoration can cause new infection in your tooth. In some cases, the endodontist may discover additional canals that weren’t treated during the initial procedure. The most common endodontic surgical procedure is called an apicoectomy or root-end resection. When inflammation or infection persists in the bony area around the end of your tooth after endodontic treatment, your endodontist may perform an apicoectomy. In this procedure, the endodontist opens the gum tissue near the tooth to expose the underlying bone, and the infected tissue is removed. The very end of the root is also removed, and a small filling may be placed to seal the root canal. Local anesthetics make the procedure comfortable, and most patients return to their normal activities the next day.